Joint HealthOlimp Glucosamine Flex - 60 kaps. Dietary supplement containing high quality glucosamine sulphate - the most important compound for the functioning of joints! Prevention is extremely important in any sport! 32 loyalty points Your cart will total 32 points that can be converted into a voucher of 1,28 PLN. OLIMP Flex Glucosamine is a dietary supplement for people exposed to overload the musculoskeletal system, trauma, sports injuries, or who have problems with joints due to age. Research shows that people now increasingly younger complain about their joints. The most common symptoms of joint problems are pain, stiffness, creaking, a feeling of roughness in the joints. These symptoms are often underestimated, and in fact may be the harbingers of osteoarthritis. Most often it occurs between 40 and 60 years of age and affects both people active in life as well as people not practicing any sports leading ", armchair" lifestyle. Studies have shown adverse articular changes observed in all persons over 55 years of age. The question arises - HOW TO HELP joints? It should first of all reduce the factors conducive to the development of the disease described, for example, to reduce body weight. Another effective way to support the joints is the use of complex dietary supplement containing glucosamine and vitamin C - substances necessary for the proper construction of cartilage and bone tissue. Supplement Glucosamine Flex is an effective and inexpensive supplement on the joints. It contains two natural substances naturally supporting the regeneration and protect against degeneration. 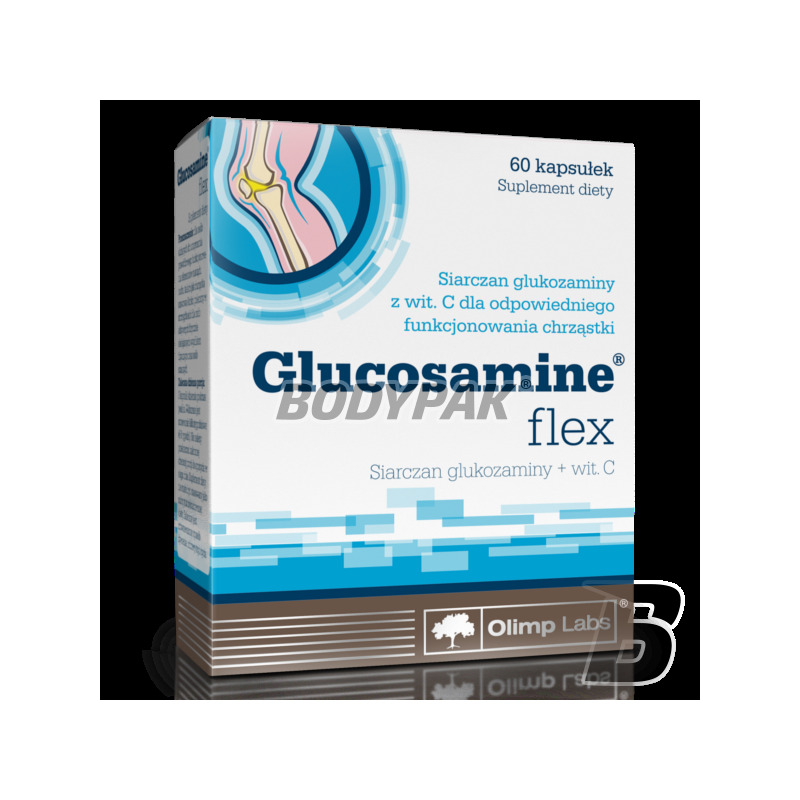 OLIMP GLUCOSAMINE FLEX - FOR HEALTHY JOINTS! Trec Joint(X)PACK - 30 sasz. Support your camera movement (joints, cartilage, tendons), and use just the supplement. A thoughtful and most importantly effective composition guarantees adequate support for your body. Do not worry, and today should obtain in the preparation! Amix OsteoGelatine MSM - 200 kaps. Convenient to use the capsule, which in addition act! Manufacturer take care of the appropriate formulation, and the convenience of the consumer. If you are looking for a proven product, and which has already reached a lot of people - do not hesitate and choose this one. Collaregen - This contains collagen, the main component of connective tissue and the innovative combination of a highly absorbable microencapsuled vitamin C (PureWayC ®), which contributes to the production of natural collagen orazprawidłowego functioning cartilage and bone. Activlab Flexactive - 20 tabl. High-quality dietary supplement providing glucosamine, calcium and vitamin D3. It promotes health and regeneration of the musculoskeletal system! Convenient form of effervescent tablets! You need support for your joints? I just found an effective product at a good price! Good solubility and interesting orange flavor. A comprehensive composition! Activlab Machine Man Joint & Recovery - 120 kaps. High-quality preparation on the joints! They should reach for it all the people practicing sports, which increase the load joints. Solgar Glucosamine Hyaluronic Acid Chondroitin MSM - 60 tabl. High-end preparation containing glucosamine sulfate and chondroitin - these are substances necessary for the proper construction of cartilage and joint tissue. Take care of your health and preventive use during increased physical activity!